Things are going well over here, except for the fact, that I want to slow summer down! It is going by WAY too fast for my liking! We are currently at Nags Head for vacation! I'm happy to be on vacay, BUT, know that means we are in the homestretch of summer. So far, we've eaten lots of good food, gone for some runs on the beach, laid out, read, and already completed a 1000 piece puzzle! Today I wanted to share a fabulous jewelry designer with you; although, if I'm completely honest, I don't really want to share because I kinda wanna be the only cool girl with this fabulous jewelry! While reading Caitlin's blog recently, she mentioned a jewelry designer called Bourbon & Boweties. 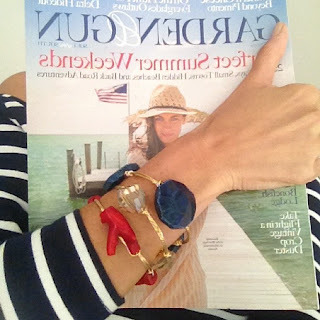 Caitlin has great style and after seeing the picture below on her blog, I knew these bracelets were something I had to have! This takes pink and green to a whole new level! What a perfect pop for an outfit! Loving the far right bracelet! 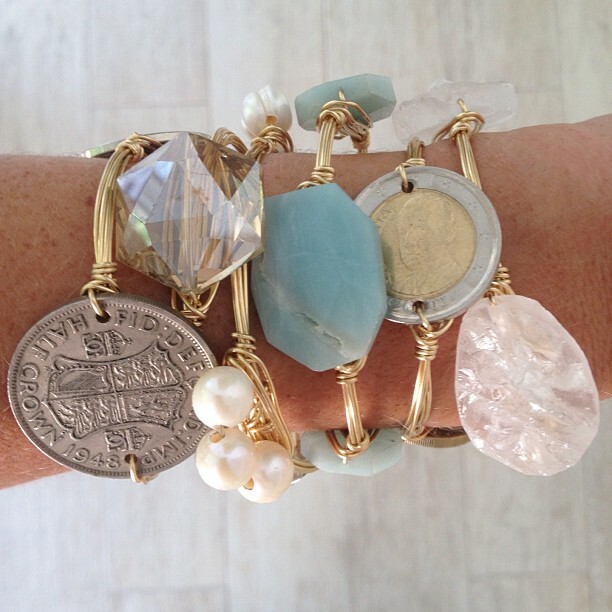 She even orders actual coins for her bracelets! 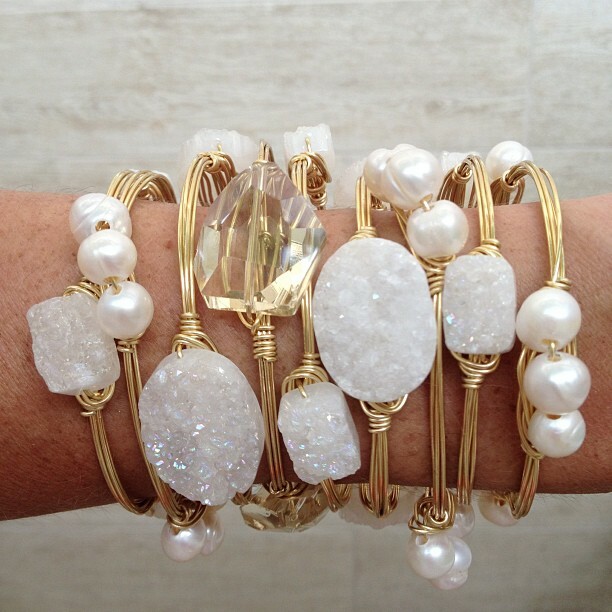 Carley designed this stack for a bride, and it really caught my eye! received these for our two year anniversary! 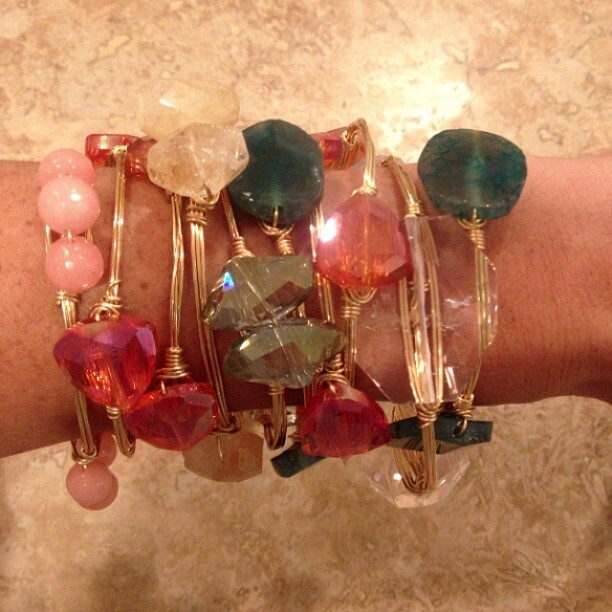 I've worn my bracelets every day since receiving them and am having fun playing with stacks! Have you heard of Bourbon & Boweties? Are you a fan of bangles or more of a statement necklace girl? I love the ones he picked out for you!!! I am more of a statement necklace girl, but I LOVE those bangles! Your outfit is lovely. I hope summer slows down for you a little bit. Savor each moment! Very cute outfit, I love those bracelets...they for sure make a statement! I've never heard of bourbon and bowties before, definitely going to check them out. 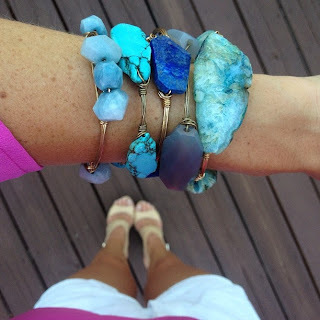 love the outfit and those bangles are gorgeous! I have been dying to order some! I messaged the Facebook page a few days ago and never got a response. How did Bryce order them? 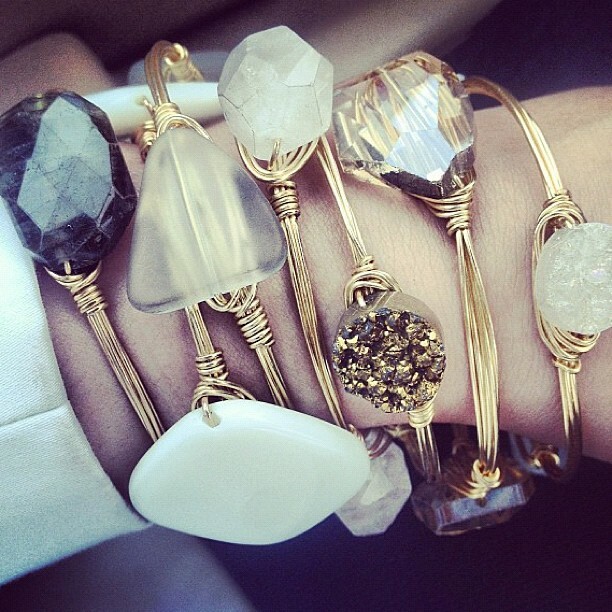 Are you still looking for Bourbon and Boweties bangles? You can find a great selection at Vignettes in Augusta, Ga and we ship! Email anna@vignettesaugusta.com for pics of our latest collection! Love them! I've also messaged them on FB twice and never heard back...I can't find them in any local stores. The coins are so unique! So pretty and your dress is absolutely GORG. you look amazing!! these are gorgeous! great post! Just gorgeous! Love that blue, too. I think it's my favorite. I love all these combinations! I need to get myself some! Where can you get them in Richmond? Hope you have a wonderful week sweet girl! We have a selection of Bourbon & Boweties available at lillitori.com!